Submitted by Simon Coleman on Mon, 30 Mar 2015 - 16:39. The subject of wells on the Northfields Allotments is an ever expanding subject. As time goes more and more information about wells and their use will come to light. There are at present (March 2015), 12 known sites of wells on the Northfields Allotments. The current wells appear to have been created after WW2. I have been told in Nov. 2016 by "David" a gentleman who was born in 1954 and lived in model cottages in the 1960's that he knew of two wells in the early 1960's one in the south end and one in the north end. The well on plot 198 was built in 1976 by "Barney" who lives in Loveday Road, in a recent coversation he told me that there was Soft rush growing in this spot and he knew that this plant prefers wet conditions which was the reson he built the well in the area, he said he dug the well in three steps and put air bricks in the bottom and lower sides to allow water into flow into the well. The well on plot 229 was built by a plot holder who started his tenancy in 1946. Other wells have a internal construction of metal barrels and these barrels are still intact in most cases. It is possible that there were wells before these current wells or some were adapted from earlier wells but we have no fact of this at this moment. There were two ponds on the allotment. One at the top of the current site and one at the bottom of the current site. There is a water courses mention in the Tenancy agreement in 1844. There were known ditches running down both side of what is now Northfield Avenue which were fed via the large pond where St. John's Church now stands. Mr R. W. Weal was the tenant of plot 229 from 1946 until 1993 when his son Dennis Weal took over the plot. In the decades after WW2 a number of plot holders built their own wells as there was no mains water on the allotment until around 1995. Mr R Weal dug his well which is constructed of metal water tanks placed on top of each other with the bottom cut out. 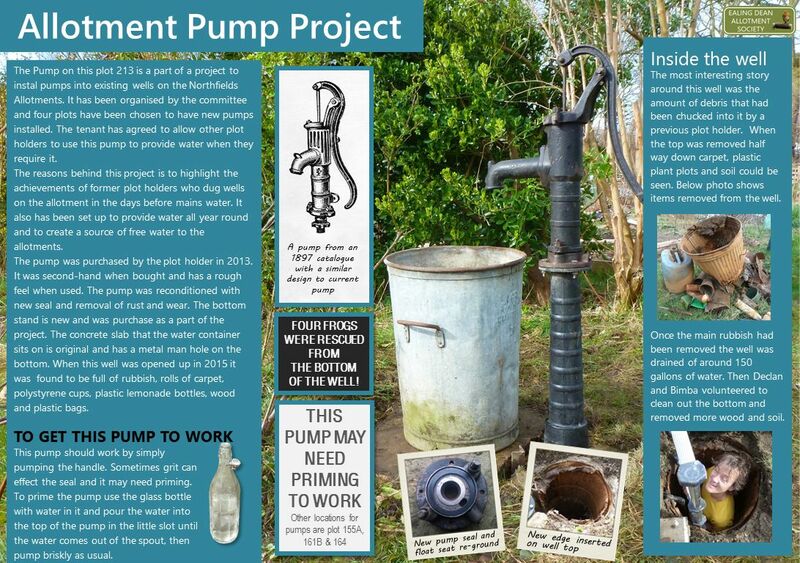 He also installed a K4 Semi-Rotary pump to extract the water. His son Dennis told Christina Fox that they constructed a shed around the pump to stop people using it as the handle was broken by people using it. If you would like to see the shed it is now rebuilt in original design on plot 198. 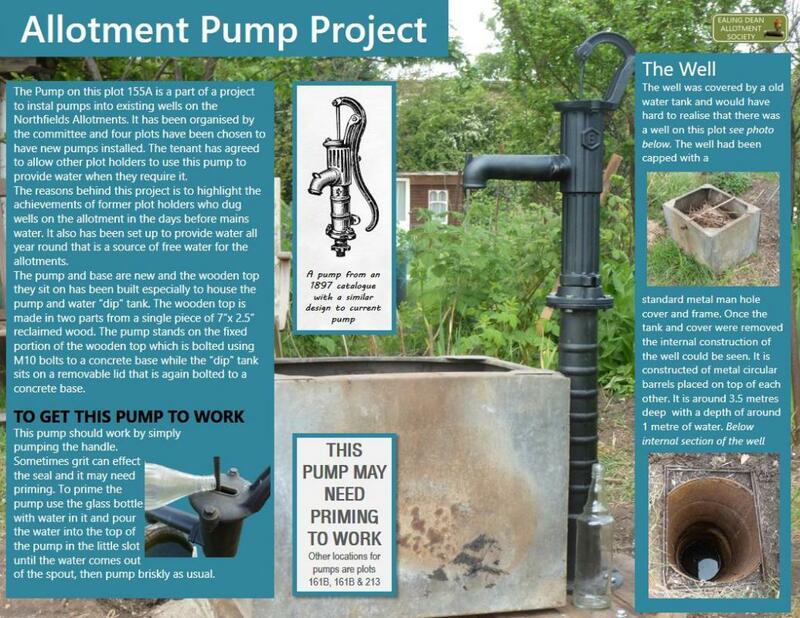 In 2015 i started a project endorsed by the Ealing Dean Allotment Committee to instal four pumps into existing wells on the Northfields Allotments. 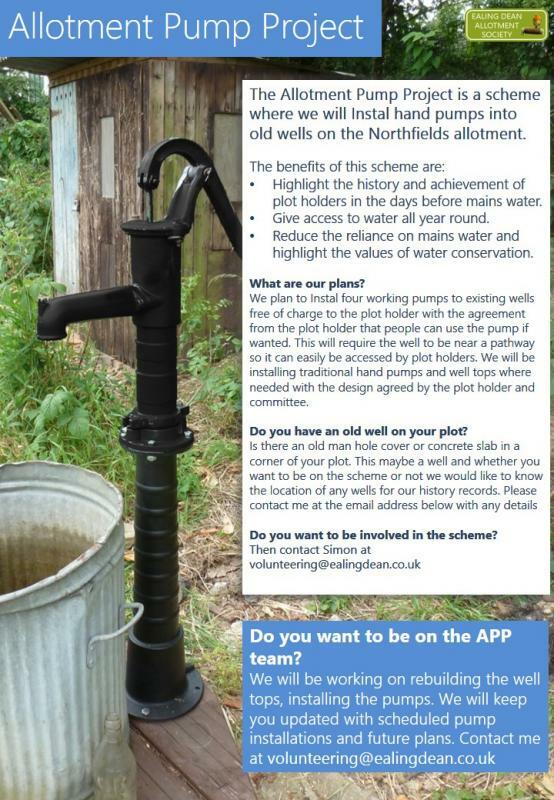 The pumps are for all plot holders to use, therefore it was necessary to have the agreement of the plot holder to allow people to use the pump and that it was preferably in a location that was easy for plot holders to use. The four plots that were chosen were 155A, 161B, 164 and 213. Plot 155A is a plot in the south part of the allotment. It has a well that has been created with circular barrels placed on top of each other. The well top has been capped with a man hole cover as other well have been. 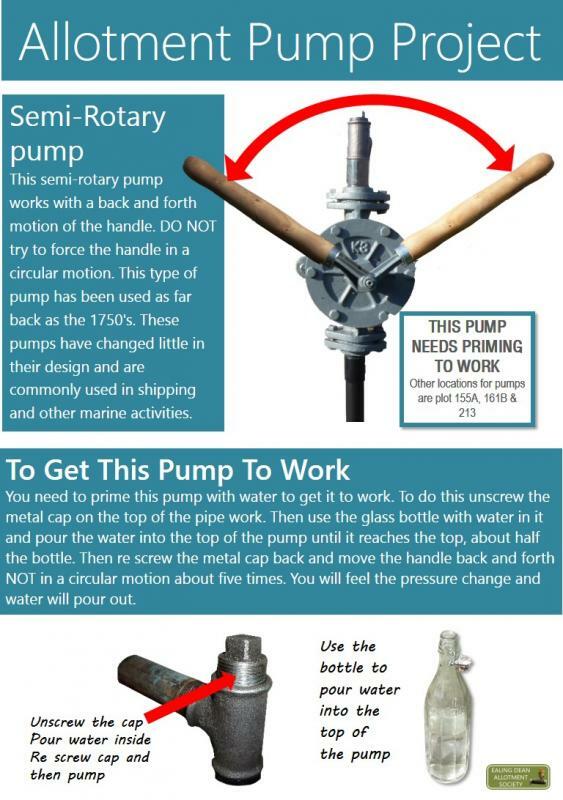 This pump does not always need priming, i would recommend trying the pump first and if it feels very light then there is no water in the cylinder and therefore you will need to follow the priming process. 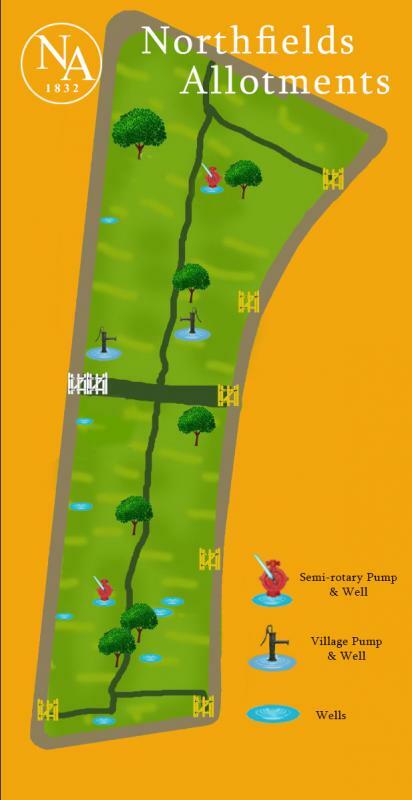 The reason why we have installed a semi rotary pump in this well is due to the wishes of the plot holder "Sim" to keep the metal frame that sits over the well. 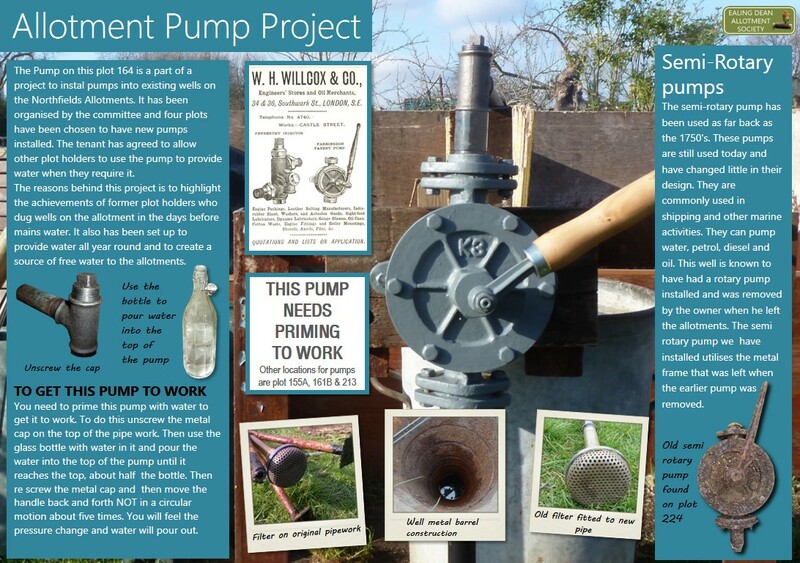 I thought i was a good idea and believed that a rotary or semi rotary pump is likely to have been used previously when the well was in use. 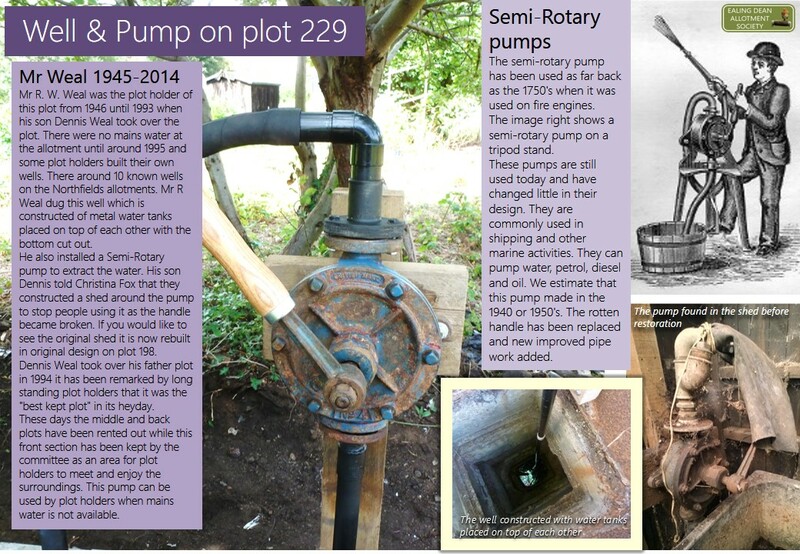 Semi rotary pumps have been found in two other instances on the allotment, on plot 229 and 224 which gives us an understanding that they were used by some plot holders, these two pumps are in fact the only existing "old" pumps to be found on the allotment. Installation work on this pump started in April 2105.The first thing i did was remove the very heavy concrete slab on top of the plot. It was then that i discovered that the well was half full of rubbish. The image right show the top of the well with the metal barrel construction damaged or bend over on purpose. Once i looked down into the well i could see a roll of carpet, soil and plastic flower pots. I have a very long pole with a hook and cup on either end.